Well, it's been a day around here. We had planned to attend two family gatherings. I was excited because we were all finally going to meet my new baby nephew as my brother and sister-in-law are in town for the weekend. Unfortunately, we ended up going nowhere. Lincoln has had a runny nose and cough for the last few days and overnight it has sounded a fair amount like croup. So, obviously we did not want to share our contagious germs - and we stayed home. It was a rather long day filled with blowing noses and coughing. 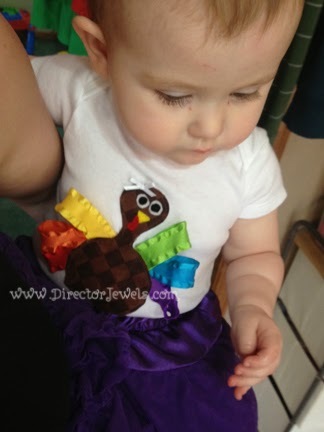 Last year we stayed home because we had a newborn on Thanksgiving. That was a much better reason to miss family gatherings. Anyway, we're hoping that everyone is on the mend. 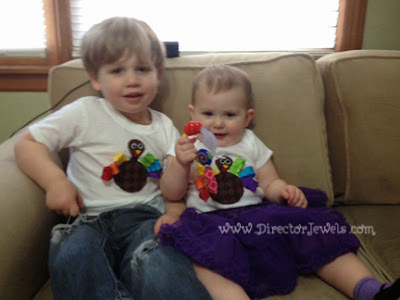 The kids still looked cute in their (very hastily and at-the-last-minute crafted) turkey shirts. And this afternoon, we even got a jump on putting up the Christmas decorations. 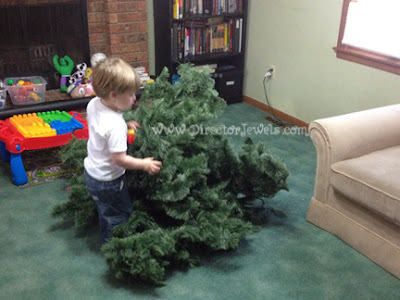 Lincoln shouted "Christmas tree in OUR house! Yeah!" about twenty times. It's pretty safe to say he's excited. I am already a little bit worried about how many times the kids are going to knock it over this year. The night ended with Lincoln biting the inside of his lip while running around like a little crazy man. We are quite ready for a new day!